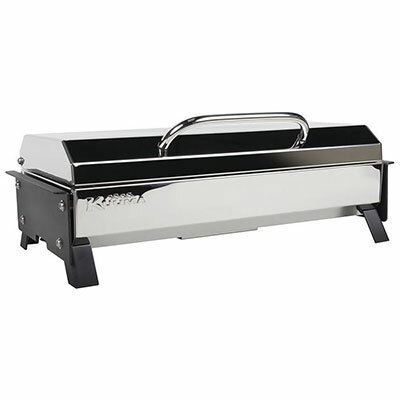 Heat Output: 9,000 BTU, Grilling Area: 17.25" x 8.75" / 145 sq. in. Grilling Area: 17.25" x 8.75" / 145 sq. in. *Note: Do not use fold-away legs for grill support on boats. Material: Anodized Aluminum, Stainless Steel and Plastic, Height: 30"
Mount with Quick-Release Knob Fits Any Square or Round Rail 7/8" to 1-1/4"
Mounts to Any Square or Round Horizontal Rail 7/8" to 1-1/4"
Mount Fits Most Rod Holders with Cross Pins, Height Adjustable Additional 5"
Color: Black, Dimensions: 16" x 19" x 1-1/2"